Sail-World – Is this a ‘new era’ of hull design? 19 May Sail-World – Is this a ‘new era’ of hull design? Revolutionary? Definitely.Innovative? Without a doubt. It’s called the Sea Ski and while it may look like an ordinary catamaran at first glance, an ordinary catamaran it is not! Big claim, for sure, but at this stage I’m not going to argue with him. Last week I grabbed the opportunity spend some time behind the wheel of this most unusual vessel and to describe the feel when driving the boat as ‘different’ would be an understatement. Trevor Payne hails from Chinderah, on the Tweed River just on the NSW side of the border with Queensland. 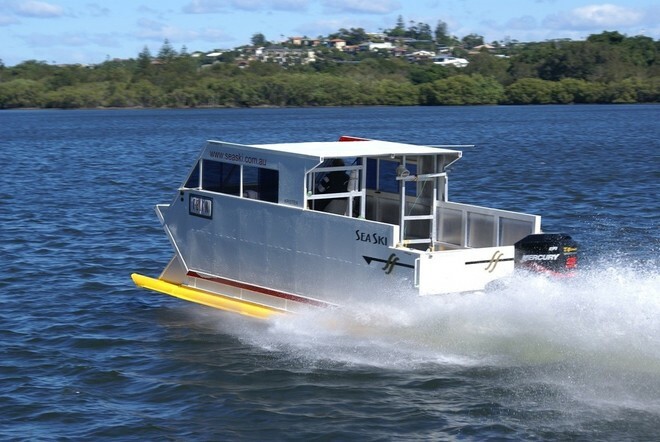 We launched this unique vessel at the Fingal Head boat ramp and gave it a ‘blast’ up and down the Tweed River. It’s difficult to describe the ‘feel’ at the wheel. The boat almost feels ‘skittish’, but we were operating in a fairly brisk cross-wind; in more stable conditions Trevor assures me the boat runs as though it’s on rails! One thing I learnt very quickly; don’t slow down in a hurry; decelerate quickly and you’ll almost go through the windscreen as the skis dig in and bring the boat to a stop as though a brake was applied.! Theoretically, this 6.5-metre rig with a 225hp Mercury outboard, installed on a jacking plate at the transom, has the capability of doing a Brisbane-Sydney run in much the same time as a car! I say theoretically because the boat’s fuel capacity would not allow it to actually do that. Nevertheless, Trevor has timed boat (via GPS) at 90km/hr cruise and 120km/hr at wide open throttle. The secret to the boat’s performance stems from the full length ‘skis’ beneath each sponson; each ski also has full length running strakes. As Trevor explains, the design calls on an aviation ‘trick’ in that it uses speed to generate an effect aircraft pilots refer to as the WIG (wing-in-ground) experience. ‘This is created by a cushion of air, essentially between the ground and the wings of a landing aircraft and it offers more lift to the aircraft at slowing down speeds,’ he explains. ‘Consequently, when the Sea Ski achieves that same WIG effect it is actually floating on a cushion of air,’ he added. According to Trevor, this WIG effect allows the Sea Ski to virtually float across wave troughs as they open beneath the hull. ‘The leading edges of the skis have wave piercing attributes and deal with higher than average waves tat would probably jar a more traditional hull,’ he says. Additionally, Trevor believes the design can best be described as a ‘high performance sea skimmer’, able to maintain speed in seas that other vessels would be forced to slow down in. In between its skis or sponsons, the hull of this all-aluminium vessel is perfectly flat, helping compression of the air gathered beneath. Other ‘bonuses’ Trevor claims for the Sea Ski design include capability of shallow water operation (it has minimal draft), stability when anchored, excellent fuel consumption and low maintenance. At this stage, Trevor has priced the boat, ready to go, at about $275,000. He is quick to point out that he personally is no boat builder. ‘My role will be in management, marketing and quality control, I’ve given the manufacturing rights to a competent boat builder in the form of Harwood Marine International,’ he explained. Trevor is not kidding when he says ‘a competent boat builder’. Harwood Marine International, situated on the banks of the Clarence River, near the famous holiday spots of Yamba and Iluka, is renowned as a world class shipyard. Summing up, despite what some may feel are ‘unfounded’ claims for the design by Trevor Payne, what he has done (or is going) is thinking outside the square. For that alone I give him 10 out of 10!